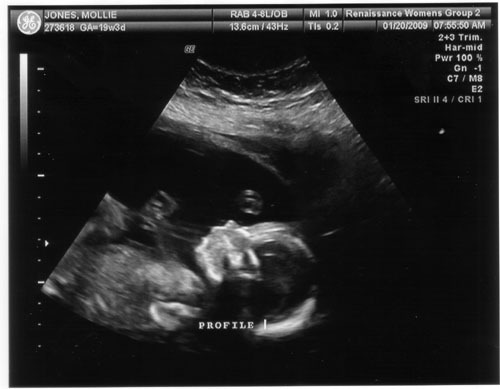 Today was the twenty week exam and ultrasound. 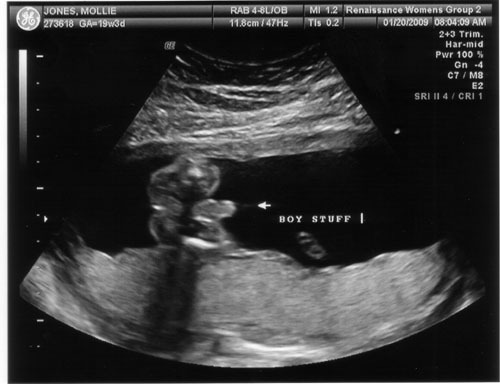 We also found out we are having a boy, very exciting stuff. 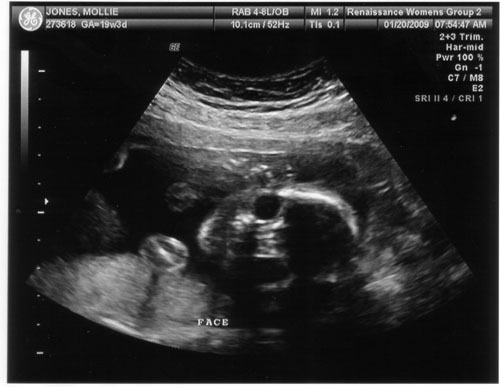 Mollie has been convinced all along it was a boy, so it appears she already has a strong mother's intuitition, which may or may not be good for baby jones. 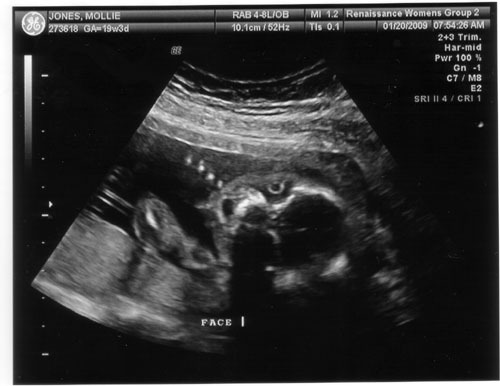 Below are some pictures of the ultrasound along with a video of the ultrasound so you can see him moving around. It's hard to believe that 2008 went by so quickly! This was our first year spending New Years at home in Austin. This was probably also the first year I didn't stay awake until midnight. I believe I passed out around 10. Pathetic. Jason did wake me up at midnight to say Happy New Year though which was cute. Not too much else going on here. We did get the closet cleared out in the office which will become the nursery. We've also had some very lazy days, or I should say I have had some very lazy days. I had a 2 day work week last week and a 3 day work week this past week. I am definitely not looking forward to having a full work week this coming week! 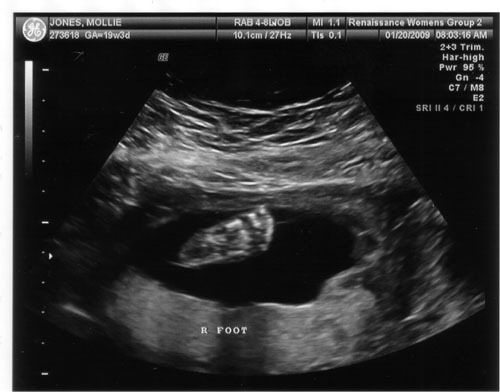 Today marks 17 weeks for me and in just over 2 weeks we will find out if this baby is a boy or a girl. I'm still having some serious boy vibes. 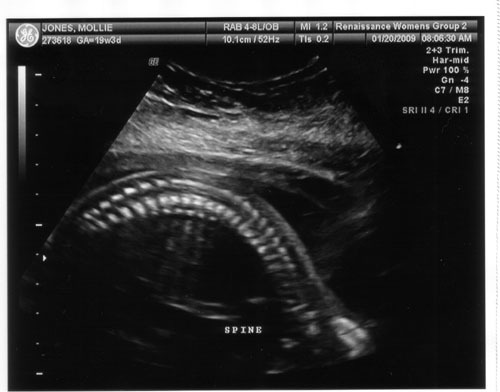 I also think I've felt some movement in the past couple days, but I'm not sure if it's really the baby yet. The book I have tell me what it might feel like and I think it just might be baby Jones! I did some prenatal yoga yesterday, and the very last exercise was just sitting propped up against some pillows for about a minute and it felt like he did a little flip. It might have been to tell me he did not like the yoga, and I have to agree with him. Afterwards I felt really lightheaded and extremely nauseas. I thought it might be good to try for flexibility and relaxation but it did anything but that. It was also my first attempt at any kind of yoga so who knows. I've been getting to the gym more regularly now that I have a little more energy and feel really good after a workout, so I think I'll just stick to that for now. I'm off to enjoy the rest of our 82 degree January evening! I hope everyone had a wonderful holiday!